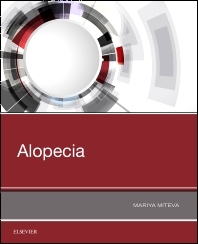 Get a quick, expert overview of alopecia with this concise, practical resource. Dr. Mariya Miteva covers high-interest clinical topics including hair cosmeceuticals, new medications in clinical trials, off-label treatment technologies, and much more. It’s an ideal resource for dermatologists, dermatopathologists, students, fellows, and researchers interested in hair loss. Presents rich visual information combined with expert opinions from the most renowned hair experts practicing today. Covers basic knowledge on healthy hair, hair pathology, and hair and scalp dermatoscopy (trichoscopy). Contains focused yet complete coverage of non-scarring alopecia, primary lymphocytic cicatricial alopecia, primary neutrophilic ciatricial alopecia, hair loss management, and miscellaneous hair disorders such as hair loss in children, hair and scalp infections, hair changes due to drugs, and more. Consolidates today’s available information and experience in this important area into one convenient resource. 18. What Should The Hair Clinician Know About Hair Transplant?